Using this method, Thierry has become the most successful male orienteer ever, winning 10 gold medals overall at the World Champs, including 7 in the middle distance race. This is mainly taken from a talk that given by Geourgiou at Tollymore National Outdoor Centre, as part of a visit to Ireland, on 20th October 2012. At the 1991 World Championships in Czechoslovakia, he won his age category in the Spectator races. This started the dream in Thierry’s head that he someday might become world champion. Over the next number of years, he played over the scenario of himself winning the World Championships many, many times, so that he had actually won it already in his head. Thierry’s father’s philosophy was ‘no training without a map’, and with this in mind, Thierry trains more with a map than any other elite orienteer. Most of the Norwegian elite he trains with are happy with 20-25% training with a map, but for Thierry, the figure has been 40-50% since 1997. WOC 2001At the World Championships in Finland in 2001, Thierry finished in a disappointing 18th place. He had to, for the first time, admit to himself that his dream might not come true. After this, he took his biggest ever break from orienteering, for several months. When he returned, he realised that, even though he was an excellent navigator, the method he used was not good enough to win. He ‘won’ the 2003 world championships over and over again in his mind, using his new method – full speed, no mistake. he was an excellent map reader, so could read all map details quickly and correctly. even if you run fast and orienteer fast, reading all the details takes extra time. with maps getting ever more and more detailed, he could not afford to read every little detail and hope to improve his speed. the map section below shows an imaginary control, using the old method – picking up every feature. While this method does get you from point 1 to point 2, it takes time to read the map in detail and pick up every feature on the ground. Thierry’s new technique focuses on reading the map much more quickly, and using visible and distinctive features to find your way. on the map below, we can see the control from anywhere within the shaded area. On the larger example below, the control is at A. We can see A from anywhere inside the Blue Area. BUT, we can see A from B, and we can see B from anywhere inside the much larger Red Area. Thus, it is better technique to use B as your attack-point – go to B and you will find A. This ‘visibility map’ is the sort of thing that Thierry will form in his head, and he will use this to find the control at full pace, without making any mistakes. If you are in an area covered with crags, with a few distinctive trees, base your navigation around the trees. Likewise, in a forest with a few crags in it, base your navigation around the rock features. essentially, don’t use rocks as a basis for navigation in an area covered with rocks! 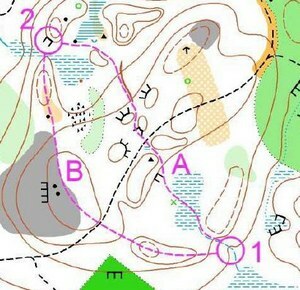 What is the common feature between every single orienteering map in the world? contours are visible and distinct everywhere, so a good orienteer uses them to his advantage, and uses them to navigate. When using visible and distinct features as the basis for your navigation, you mustn’t get bogged down with every little detail – if you are heading for a hill that you can see, you do not need to count every rock. It slows you down. However, do not narrow the technique too much – you still need to know where you are to orienteer well – find a happy medium. every feature is picked up – runner A knows exactly where he is. navigating using visible and distinctive features, runner B knows where he must go and where he will be. Route B maintains good visibility of the next feature at all times, so runner B can run at full speed. Runner A must slow down to count off features and check them with the map. 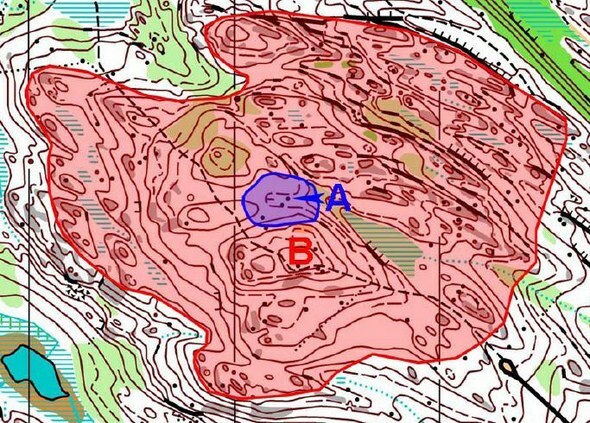 Visibility on Route A is consistently lower than on Route B – there are always hills in the way, or other crags that may distract the orienteer. To employ this technique, a visibility map must be created in the runner’s head. This ‘Full Speed, No Mistake’ method has made Thierry Geougiou the most successful male orienteer ever – try using it at the next event you go to. Try one control this way, and the next using the method you are used to and see which is faster – if you are comfortable with this method, use it – it could make you a much better orienteer.